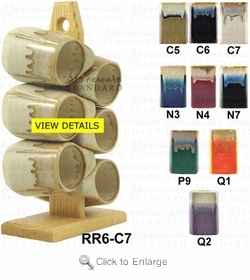 This set of six Padilla stoneware Round Rim mug is just one more example of his unique drip-looking designs with a very unusual shape. This particular Padilla stoneware design comes in 9 different colors. His designs truly are beautiful enough for any kitchen decor. You may order replacement mugs for this set here Padilla Stoneware Round Rim Mug. Understand replacement Mugs may vary in color from original mug set.